In the many articles regarding tyres and their impact on road safety, it is repeatedly mentioned that tyres are the only physical contact between a vehicle and the road surface. It is this contact, and the grip the tyre provides which allows the vehicle to start, stop and change direction. In other words, it is the contact with the road surface which gives us control over our vehicles. It is therefore imperative that this contact is maintained under any and all conditions. 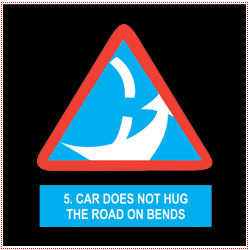 But, a road surface isn’t smooth and the wheels of a vehicle are inclined to bounce over the bumps. The suspension of a vehicle in its simplest form is there to give ride comfort. The springs which provide the comfort actually aid the bounce though. In order to contain the bounce and maintain contact the suspension is fitted with components called shock absorbers, or in some countries, dampers. Shock absorbers are filled with oil, which hydraulically dampens the road shock and prevents the wheels bouncing. 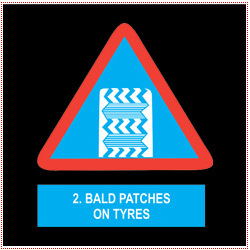 Due to this action tyre to road contact is maintained over all bumps and undulations. This in turn allows control of the vehicle to be maintained. Two main concerns can affect the performance of shock absorbers; one is leaking through damage or age, and the other is overheating through rough conditions, overloading or many other causes. Over-heating causes the oil to lose its viscosity i.e. to thin out. Air bubbles then form and mix with the oil. This severely detracts from the shock absorbers ability to perform, and bouncing starts occurring. One often hears people talking about “gas shock absorbers”. These are more sophisticated items with gas used to cool the oil. They can take far more punishment, and last far longer, but contrary to popular belief provide the same function as a conventional shock absorber rather than a softer ride or better comfort. Remember the springs provide the comfort and the shock absorber controls the spring’s action. Leaking shock absorbers lose oil and this destroys their ability to control road shock and the resulting wheel bounce.. Put very simply, the shock absorber keeps the tyre in contact with the road surface under all conditions, and between the two, your safety is maintained. Worn or damaged shock absorbers also cause tyre wear. The bouncing of the tyres allows flat spotting and other wear patterns to develop on the tyre tread. 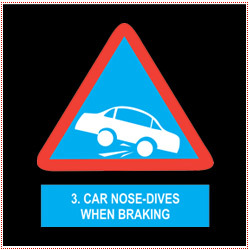 This causes another safety concern in that the grip of a tyre is reliant on the integrity of the foot-print i.e. the contact patch. If irregular wear has set in the contact patch will loose its intended shape and grip will be reduced. Shock absorbers are as safety-critical as airbags, brakes and the tread on a car’s tyres. But because the driver cannot see that their shocks are worn, it is a case of out of site out of mind. In South Africa it is estimated that 50% of cars older than five years on the road have worn shock absorbers, but drivers don’t know this because they gradually adjust their driving to compensate for the extra roll or bounce. 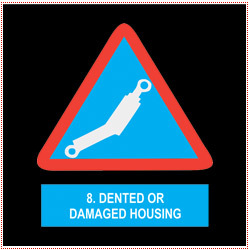 “A worn shock will reduce the driver’s ability to control the vehicle. In an emergency, there could be an accident that otherwise could have been avoided,” says Sean Staley, Gabriel brand manager at Control Instruments. Staley says the average age of vehicles in South Africa is more than 12 years, and shocks become less effective after about three years. “A worn shock absorber will cause the tyre to bounce creating worn or bald spots,” says Staley. 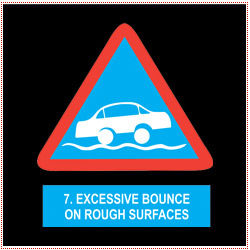 Braking on wet roads, even with good tyres, will cause tyres to bounce and loose grip. The vehicle will skid more easily in the wet. In strong cross winds, there is less control when cornering and the efficiency of anti-lock braking systems (ABS) and the vehicle’s electronic stability control (ESP) capabilities are reduced. Worn shocks will also cause suspension wear. 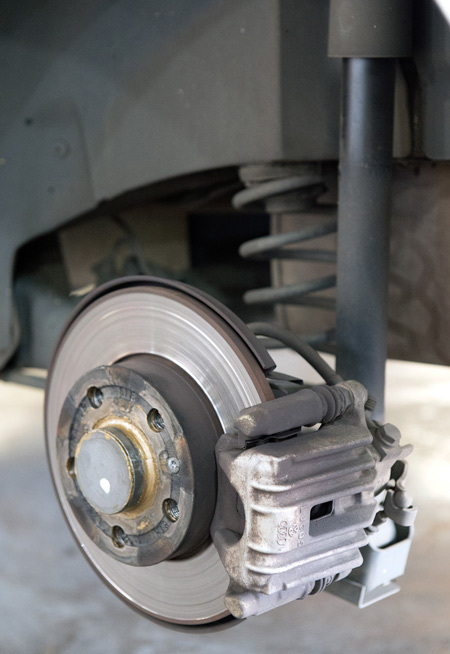 Excessive spring movement on the vehicle will make the vehicle more difficult to handle. And during the upcoming festive season, a tired driver is a dangerous driver. Overall, worn shocks will require that the driver concentrate more on keeping the car on the road. When is the right time to replace your shock absorbers? It is often said that a picture is worth a thousand words. We have come across the perfect illustration of when it would be important to have your shocks checked and most probably replaced. 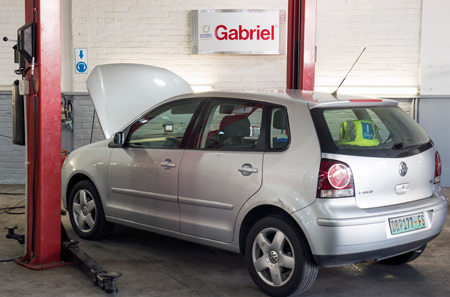 We would like to urge all vehicle owners and drivers to be attentive to those aspects of vehicle maintenance that could impact on their safety on the road. 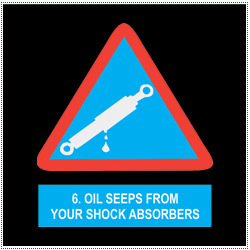 Be alert to these dangers and have your shock absorbers checked regularly! !